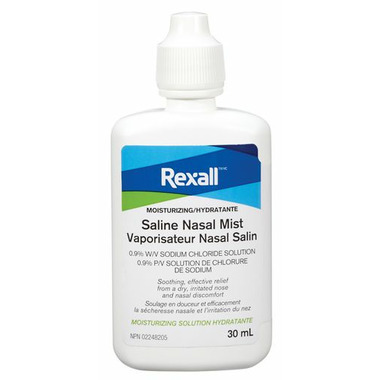 The Rexall Moisturizing Saline Nasal Mist has a soothing, effective relief from a dry, irritated nose and nasal discomfort. Dosage: Adults: With head upright, spray 1 to 2 times in each nostril one to three times daily. Infants and Children: Spray one time in each nostril one to three times daily. Rinsing: When secretions are present, use 2 to 3 sprays per nostril and wait about 30 seconds before blowing out the liquid. Repeat as needed two or three times a day.